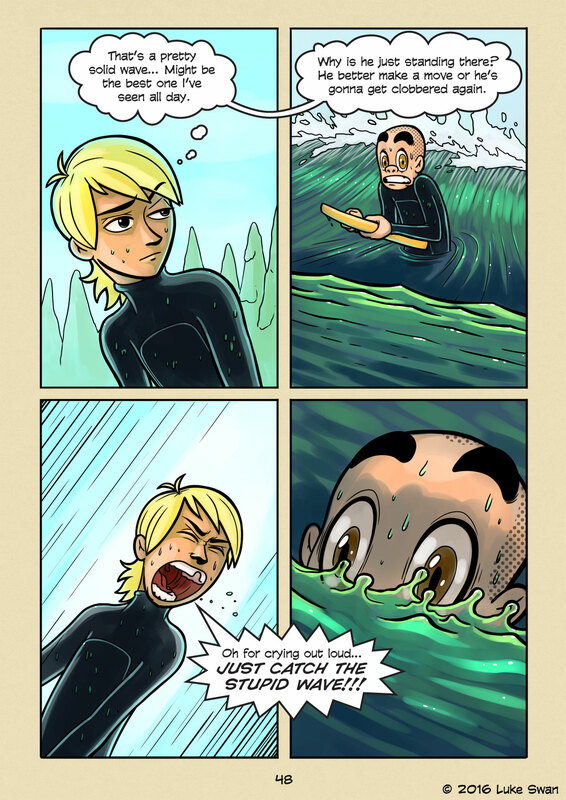 Frozen in Place (#048) | Web comic "Surfer Joe"
It usually comes from a conflict in my mind. Can I go? Or should I let it pass? I’ve written before about the importance of positioning when trying to catch a wave. The dilemma comes when my position is a pretty good, but a little bit on the inside of the breaking point for comfort. The crowd can be another factor in deciding. Are there already guys paddling for the wave? Do they look like they’re going to catch it or not? The crowds make learning to surf difficult. Mostly because in order to get good(at anything) you need a lot of reps. But with a crowd you need to share. It’s a tricky predicament for those of us who are more ambitious. I can feel my mind calculating all the variable while my body refuses to move. For whatever the reason, there is too much going on and I can’t act until I’ve sussed it out. This goes for everything in life, really. Our minds are always calculating all kinds of variables, and we act on those calculations. Whether we are aware of all the variables or not is a different story. But as long as everything compiles easily enough we act without conscious thought. It’s only when a new variable arrives, something unexpected or never before encountered, that it gives us pause. Being aware of all the variables is another interesting idea. Being aware of everything is impossible, but the more we pay attention to our surroundings the more variables we pick up on. Doing this slows down our decision making until we have enough experience and information to act freely. It is a slow process I think that can often be mistaken as laziness in people.